This course provides instruction in identifying confined spaces and permit required confined spaces, the hazards associated with these spaces and target industries. 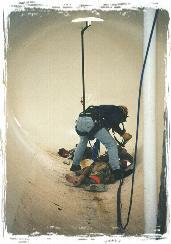 The program will cover case histories of previous confined space incidents. This class will assist the participant to understand the requirements set forth in Federal (1910.146) and State (Title 8 Sections 5156, 5157 and 5158) OSHA regulations. The program also covers equipment requirements and personnel requirements for developing compliant and safe confined space entry teams. 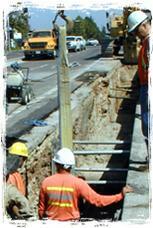 This program is exclusively didactic and does not qualify participants to make permit required confined space entries. This course provides instruction in identifying confined spaces and permit required confined spaces, the hazards associated with entering such spaces, target industries that possess these spaces and laws regulating entries and rescues performed in permit required confined spaces. Participants in this program will receive both didactic and manipulative training on all of the mandatory aspects of confined space entry and rescue operations, including atmospheric monitoring, ventilation, lock-out/tag-out, entrant retrieval systems, communication systems, respiratory protection, etc. The course is designed for those personnel who are likely to make routine or rescue entries in permit required confined spaces and complies with both state and federal OSHA requirements. This course provides the student with information regarding the requirements for safe trenching and excavations, including protective systems, soil classifications, soil testing procedures, daily inspections, high hazard excavations, notifications and high hazard excavations. 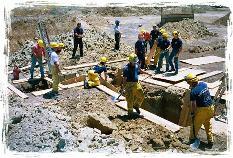 This course provides didactic and manipulative instruction in the hazards of trenching and excavation operations and rescues, case histories of trench incidents, soil classifications, ventilation procedures, entrant harnesses, victim packaging techniques, personnel requirements, responsibilites and safety. 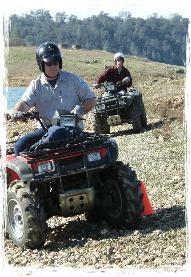 Participants will use timber shores, air shores, hydraulic shores and improvised shores. This course complies with both state and federal OSHA requirements. This course provides instruction on the hazards of falls in the workplace and how to reduce the risk. The program focuses heavily on the OSHA regulations specifically covering the minimum regulatory compliance issues for various industries as well as covering fall protection system options. Case histories are used to emphasize the risk and demonstrate the purpose of the regulations. This course provides all of the CPR and choking skills for the adult, child and infant patient, including use of devices such as pocket masks and automatic external defibrilators, etc. The American Hear Association course completion cards are issued upon successful completion of skills and written evaluation. 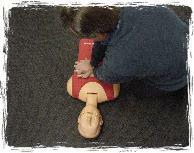 This course provides the CPR and choking skills for the adult victim. Instruction on use of devices such as pocket masks is included. 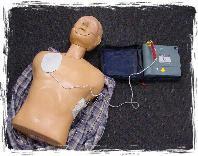 Information regarding automatic external defibrillators is imparted. the American Heart Association course participation cards are issued at the completion of the program. This course provides the CPR and choking skills for the adult victim including complete instruction on the use of an automatic external defibrillator. The American Heart Association course participation cards are issued at the completion of the program. This course provides a review of the dynamics of water and effects of moving water, equipment and personnel needs for effecting water rescues, basic safety considerations and case histories of previous successful and unsuccessful water rescues. Manipulative training to include basics of upstream spotters and downstream back-ups, throw-bag operations, shallow water crossings, tension diagonals, basic swiftwater swimming skills, live bait rescues and other techniques. 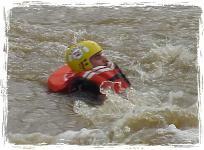 This course provides complete instruction on the use of personal watercraft for rescue in both open water and swiftwater environments. This program includes a basic watercraft safety course, instruction on pre-trip and post-trip inspections. Static and dynamic water operations, watercraft launching and loading techniques, victim pick-offs and pick-ups, line crossings, team development and comprehensive practice sessions. This course includes instruction on basic rope theory, construction and materials, basic hardware and software equipment review. 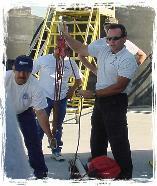 Instruction on rescue and related knots and hitches, rigging systems and anchor techniques. Participants will construct lowering systems using friction devices, raising and hauling systems using mechanical advantage systems. Instruction will also include victim harnesses and packaging systems. Program includes practice scenarios. 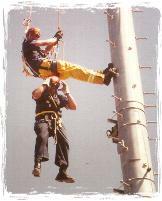 This course is a continuation of Rope Rescue 1. Students will construct more complex rope systems from higher elevations and vertical environments. Systems included in this program are systems were personnel will travel from high points to low points and where personnel will travel from high point to high point traversing voids. This program also includes significant trouble shooting of systems. This course provides instruction on patient surveys, shock, bleeding control, treatment of fractures and dislocations, snake and spider bites, poisonings, bandaging, etc. 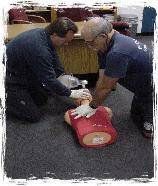 The program meets OSHA requirements for First Aid instruction. Two year course completion cards are issued at the completion of the program. This course provides participants with information on the legal aspects of emergency care, topographical anatomy and body systems, patient evaluation, vital signs, respiratory emergencies, oxygen administration and airway adjuncts, cardiac emergencies, shock, poisonings, bleeding control, fractures and splinting techniques, patient packaging and carries, characteristics and treatment of seizures, diabetic emergencies, emergency childbirth, burns and drownings. Fundamentals of strokes, overview of drug and alcohol abuse, introduction of communicable diseases and triage. Certificates of completion are issued to all participants completing the program. This basic course includes information on risks of transmission of bloodborne pathogens and how to reduce those risks. The program focuses on techniques that are simple to implement within the workplace. National statistics of exposure and infection are cited on prevalent pathogens with simple prevention policies. This course provides instruction on how to manage the small or large scale emergency. This program includes the theory and history of the Incident Command System, basic components of the Incident Command System and their importance, overview of the Incident Command Structure and the different positions as well as how to activate and work within local, regional and federal emergency response systems. 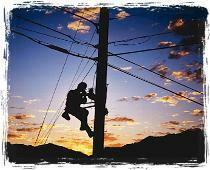 This course provides instruction on the hazards of energy sources in the workplace as well as how to identify energy sources and secure them to assure safe work practices. The program covers the state and federal regulations as well as case histories and components of a regulatory compliant program. This course provides instruction on the hazards of A.T.V. 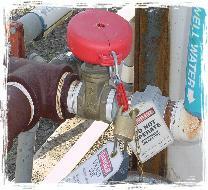 's, P.P.E requirements and safe operation practices. Manipulative training will include pre-ride safety checks, basic braking exercises, turning exercies and operation on slopes.